So what’s the difference between body butter and lotion? Does it really matter? Maybe you’re not sure which one to reach for with your skin type. And with so many DIY recipes and products available, it can be confusing to know when to use body butter and lotion. I know I have certainly gone through countless recipes and products in search of what is best for my skin. So, let me share with you what I’ve learned to so you can choose what’s best for your skin! Body butter is typically a combination of natural butters, carrier oils, and specialized ingredients. And it does not typically contain water or hydrosols. Natural butter contains essential fats and minerals. Common types of body butter include shea, cocoa, palm, and mango. Learn more about the benefits of natural butter including a printable guide in All About Body Butters. Carrier oils are used to hold and deliver essential ingredients into the skin. 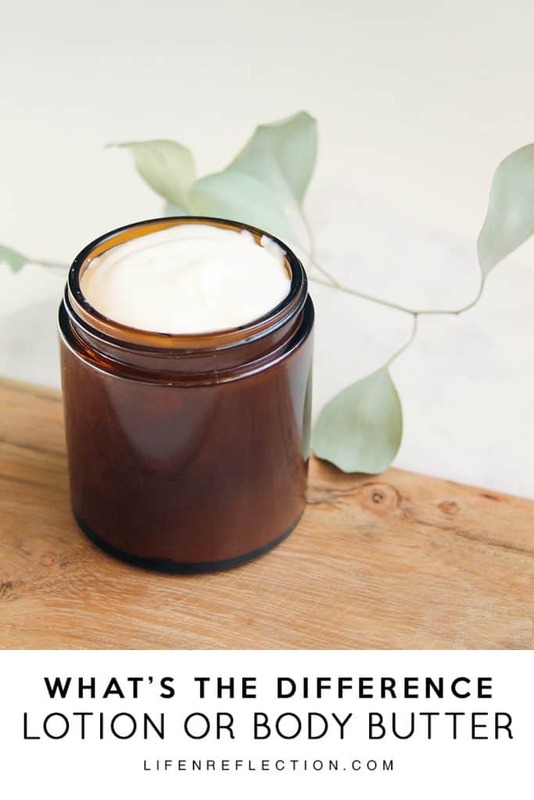 Combining natural butter and carrier oils with additional specialized ingredients such as honey, aloe, vitamin E oil, or essential oils adds to the skin nourishing abilities of body butter. Grab printable body butter and carrier oil guides and more in the Life-n-Reflection Resource Library. Body butter is used to retain moisture, lubricate and nourish the skin. They are thicker in consistency and therefore may stay on top of the skin longer. This actually helps to reduce the loss of moisture and works best when applied to damp skin. I recommend applying it right out of the shower for the best performance. But keep in mind, because it’s a heavier product, you don’t need as much. Try my natural recipes for Pumpkin Lavender Body Butter and Whipped Body Butter. When you need intensive moisturizing reach for body butter! It is ideal for the hands, feet, elbows, and knees. It typically takes longer to sink into the skin, so it may leave a slight oily barrier depending on your skin type. Body butter can be pore clogging, which is why you may want to avoid applying it to your face. I use body butter most often in the winter when I’m combating dry skin. Lotion has a similar make up to body butter but does not contain natural butter. It starts with a carrier oil such as coconut, sweet almond, apricot, and jojoba. Learn about carriers oils and grab a printable guide in Natural Carrier Oils by Skin Type. Either water, a hydrosol, herbal infusion, or aloe is added to the carrier to make the thin consistency. It’s basically an emulsion blended of oils and water. Lotion is much lighter and thinner than body butter. It is usually has a non-greasy feel and it absorbs quickly compared to body butter. It is great for nondry skin and even oily skin types. Try my recipe for Texas Cedarwood Hand Lotion. Reach for the lotion when you need lightweight moisture. It is especially ideal for the face, legs, stomach, and arms. Lotion is surprisingly quite moisturizing even though it much thinner than body butter. This is because our skin soaks up the water or substances that have a high water content such as herbal infusions, hydrosols, or aloe. Due to lotions’ nongreasy consistency and quick absorption, it is convenient to apply throughout the day. 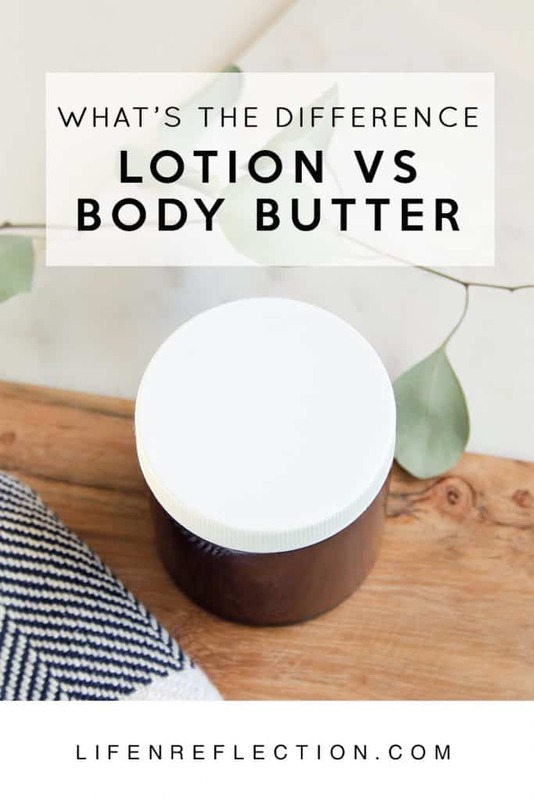 Which is Best For Your Skin Body Butter or Lotion? The answer to this question really depends on three factors. As a rule of thumb, lotions usually work well on oily areas of the skin and body butter works best on dry areas of the skin. Lotions lubricate and quickly soften the skin. While body butter will stay on the skin longer, helping to prevent loss of moisture and deeply moisturize overtime. So, you will likely find yourself using both! As we are often made up of a mix of dry and oily areas. Which one do you use most often? Body butter or lotion? Share in the comments below. P.S. Find everything you need to keep your skin moisturized from head to toe in my book Winter Skincare Survival Guide!